Will Eisner is best known for creating The Spirit, but that's far from his only contribution to the world of comics. He created the Blackhawks for Quality Comics, home of Plastic Man, coming up with the backstory and designing the uniforms. 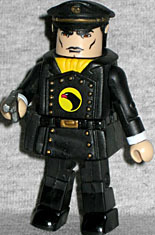 The Blackhawk Minimate looks very impressive, with unique molded pieces for his jacket and hat - no, it's not the same piece M. Bison wore. The jacket (which is done in two pieces to allow the waist to move) has sculpted buttons, a belt with holster on the righ hip, raised lapels and a scarf tuckeed in at the neck. The Blackhawk symbol is painted facing the right direction for once, and while most of his uniform is matte black, the boots are glossy. He comes with a silver and black pistol to put in his holster. Sgt. Rock is DC Comics' quintessential war character. His adventures started in the '50s and ran uninterrupted until 1988. 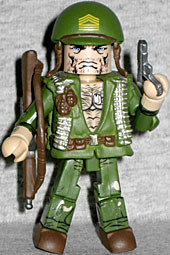 The Minimate does a nice job of duplicating Joe Kubert's ragged artwork: his face has the wildly grizzled look of a man who's spent as much time at war as Rock has, his silver dog tags hang against his bare chest, and he has a bit of hair on his forearms. His helmet has the insignia of a Master Sergeant, though they're the desk jockeys and it's the First Sergeants who would be in charge of a Company. His coat is a new piece, with an ammo belt draped around the neck, two grenades on the chest, and a knife and canteen on the back of the belt. His pants and sleeves are painted with small wrinkles, and the knees are torn. He's armed with a machine gun and a pistol (if you want to give it to him - the set includes two, but they're both next to Blackhawk). It used to be that war comics were a genre staple, but these days they're much more rare. However, there's a new Blackhawks comic in the DC relaunch, and a new (modern) Sgt. Rock appearing in Men at War. These particular military men may not be seen very often these days, but their legacy lives on.